Vistara has bagged the prestigious ICMG Global Architecture Excellence Awards 2018 at the Architecture World Summit 2018 recently held in New York, USA. Vistara’s Robotics Program – of which the airline recently introduced India’s first robot designed to assist travelers at airports – was adjudged the winner in two categories – Artificial Intelligence & Robotics Enabled Solution and Customer Centricity & Excellence categories, by an eminent jury panel led by Mr. John Zachman, known as the Father of Enterprise Architecture. Vistara’s robot won against innovations from some of world’s biggest organizations operating in diverse sectors. Winners of the coveted ICMG Global Architecture Excellence Awards are selected through an elaborate, stringent process of four rounds that requires showcase of technology expertise, deep domain understanding, overall vision for the industry and a case study presentation at Architecture World Summit. 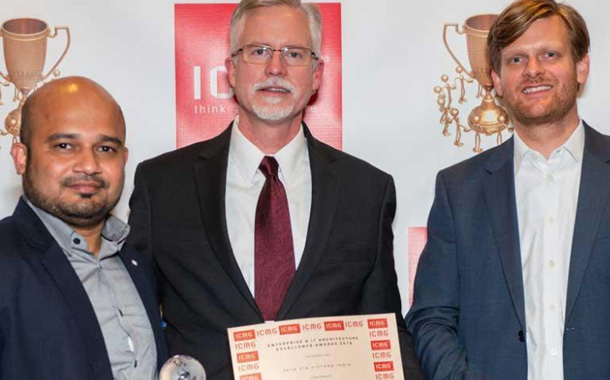 In the last 12 years, ICMG Architecture Awards have become the most prestigious global award program honoring excellence in the Enterprise and IT Architecture, with the leading companies from over 30 countries participating every year. Vistara’s robot was also recently awarded by ET NOW for ‘Excellence in Leveraging IT for Business Performance. As part of its futuristic technology framework, Vistara introduced the first-of-its-kind robot earlier this year and ushered in a novel innovation in the form of an indigenously built robot that assists travelers in the airline’s lounge at New Delhi’s Terminal 3, Indira Gandhi International Airport, addresses their queries and also entertains them. It is built on a chassis of four wheels, enabling it to rotate 360 degrees, and has three in-built cameras for cognitive interaction. At present, the robot is equipped to perform functions such as scanning boarding passes, providing useful information about the terminal, departure gates, weather conditions of the destination city, real time flight status, play songs, games, etc. The robot’s capabilities are being enhanced and it is being upgraded to perform more complex tasks in the near future, to assist travelers in many more ways. As the highest-rated Indian airline on Skytrax and TripAdvisor, and winner of several ‘Best in Industry’ awards, Vistara has consistently raised the bar for operations and service delivery in the Indian aviation industry in a short span of less than four years. The airline today serves 22 destinations with over 800 flights a week and a fleet of 22 aircraft, and has flown over 12 million customers since launch.